1 bedroom, open plan kitchen/dining/living area. Shower unit/toilet/hand basin. 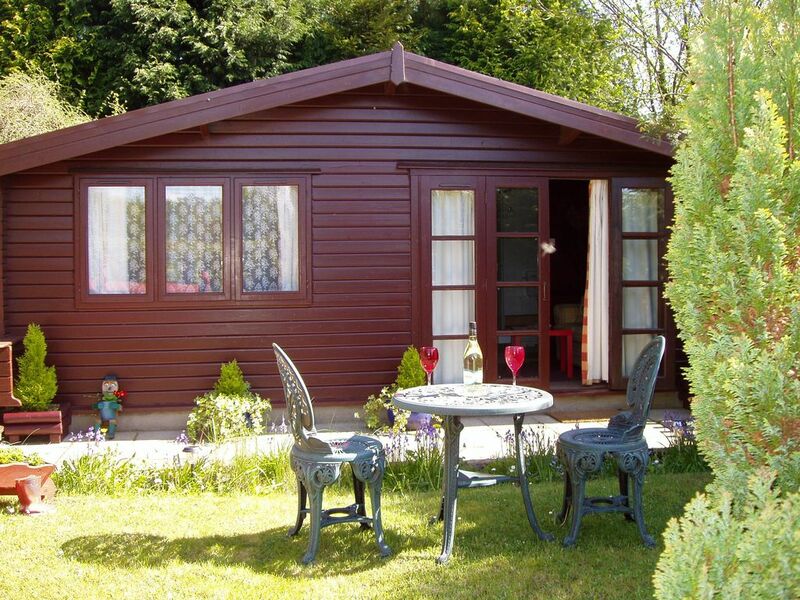 Benefiting from easy access to M4 - Junction 34 - this self catering, self contained pine lodge has much to offer guests wishing to relax and unwind in a rural setting. Nestling in the hamlet of Castellau, it is centrally located for both Cardiff, the Rhondda Valleys, Brecon Beacons as well as coastal areas. The historic town of Llantrisant with restaurants, gift and coffee shops is within easy reach. Close to hand are the Rhondda Heritage Park, the Welsh Folk Museum at St. Fagans, the Royal Mint Experience as well as an abundance of castles. To the north within a 45 minute drive are the Brecon Beacons, to the south the Glamorgan Heritage Coast, both offering superb walking terrain and wonderful scenery. Equipped with all the basic essentials, this pine lodge serves as a comfortable , cosy base for those wishing to get out and about exploring the local area or simply relax, unwind and recharge your batteries in its rural setting. Quiet, rural location with no passing traffic, a stay here can be as busy or as leisurely as you like. Local shops approximately 2 miles away in village or 24hr supermarket 3 miles away at Talbot Green. Heating/electric by way of £1/£2 coin meter. Shower unit/toilet/hand basin. Heated towel rail. Open plan kitchen/dining/living area with settee, coffee table, TV, DVD..
Garden area with patio table and chairs. It was nice peaceful and everything in the accommodation I needed. Amazing property, had everything we needed for our stay. Rita really went above and beyond to ensure that everything was included and that our stay was extra special. Would definitely return. Thanks for lovely review - much appreciated -glad you enjoyed your stay. Lovely quirky cabin which was well equipped and beautifully clean. Host gave lots of information and ideas for days out. Great location, handy for Cardiff, shopping, castles and the Royal Mint which was really interesting. Highly recommended and would probably stay again in the future. All in all fantastic price, fantastic landscapes and scenery, really clean and equipt with everything you would need recommend a stay.